The signs were all there for Father Figures to fail, so I really shouldn’t have been that surprised that it sucked, yet I was still not prepared for how lousy it was. 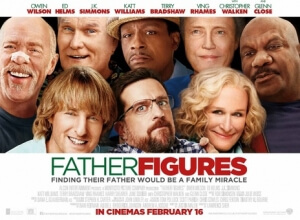 This was a comedy that got bumped around quite a bit – shot in 2015, it was originally scheduled to come out in late 2016, then got moved to the following January, and then almost a year later in December with a UK release following a couple months later – and at more than one point wasn’t even called Father Figures; it was named Bastards for a while in the States, as well as Who’s Your Daddy? in the UK, but of course got changed to what it is now so it could be more marketable to audiences. None of that made any difference, as the movie bombed at the US box office and scored pretty poorly with critics, who named it one of the worst comedies of the year. The thing is, I’m not sure I can even call it a comedy – not because it’s completely 100% laugh-free, which it is, but for a lot of the running time it seems to be under the false pretences that it is, in fact, a drama. Yes, that’s right, Father Figures is one of those dumb comedies that takes itself incredibly seriously and turns the melodrama up to eleven in all its sad scenes, like it thinks it’s an Alexander Payne movie or something. Well, it most certainly is not an Alexander Payne movie (or at least, not one of the good ones), and is instead a poorly executed waste of time that is so lazily written that it couldn’t mine for laughter if it were there right in front of it. The story is of twin brothers Kyle and Peter (Owen Wilson and Ed Helms, the least convincing on-screen twins since Adam Sandler acted opposite himself in Jack and Jill), who learn that their father, long thought dead, may still be alive. The problem is, their mother Helen (Glenn Close) has no idea who he may be, since apparently in her youth she went through more guys than a person with a cold goes through tissues, so the two estranged brothers set off on a cross-country journey to find potential matches, from American football player Terry Bradshaw (playing himself) to criminal Roland (J.K. Simmons) to their local vet Walter (Christopher Walken), with decidedly mixed, and astoundingly boring, results. It’s boring in the sense that this is a stock plot you’ve seen a million times before, and you can see everything that’s coming from miles away like twist after twist that “hey, maybe this guy isn’t the father after all” as well as each joke that they’re trying and miserably failing to set up. Nothing about it makes you laugh, because it’s written so poorly and directed with almost no life to it that it quickly becomes a dead zone of comedy, the kind that can put you to sleep because it’s so crushingly dull. The lines and scenes that these actors are given to try and make funny fail to do so on more than several occasions, and the chemistry between Helms and Wilson is extremely flat for most of it; you buy that these two are related in some way about as much as you believe that they’re meant to be twins, which is to say not in the slightest. Same goes for the majority of the people playing their potential fathers, who look and act like they are above this thin material for the whole of it; even Terry Bradshaw, not primarily known for his acting, feels like he’s just doing this because there was nothing else for him to do that weekend. The only actor to not completely embarrass themselves in this movie or come out of it without most of their dignity intact is Glenn Close, which is weird because her character and her rampant promiscuity is a source of a lot of the awkward jokes in this movie, yet in the few amount of scenes she’s in she gives it her all, in a role and especially a movie that does not deserve as many good actors as it has. Other than the fact that it’s so unfunny it can actually make you lose concentration, this movie has a serious problem with tone, and a lot of that leads back into how this movie, at several points, thinks it’s a hard-hitting family drama. You will have some very serious scenes involving Wilson and Helms talking to each other about how much their lives have deteriorated, and then it’s followed by Katt Williams as an eccentric drifter doing some weird things that are clearly meant to be funny. The biggest offender is the final major revelation, which goes into detail about a very heart-wrenching backstory in which tears are shed and the vibe is extremely depressing… and it comes mere minutes after a scene wherein the characters burst into a veterinary operating table and stare at a cat’s gigantic testicles. Any suggestion that this film is meant to be taken seriously is immediately obliterated once it introduces random gross-out gags like that, and the movie never earns those scenes of genuine drama because it comes after nearly two hours of an extremely unfunny comedy from the cinematographer of the Hangover films (no seriously, director Lawrence Sher previously worked as Todd Phillips’ go-to cinematographer, and this is his first feature as a director – so it’s not only bad, it’s Transcendence bad). Look, if you want a version of this story that’s done way better, and certainly a hell of a lot funnier, just watch the season one episode of South Park where Cartman goes on his own quest to find his father; it’s only twenty minutes next to however long this one felt, and contains more laugh-out-loud moments than any second of Father Figures, which is a gigantic waste of time and an extremely unfunny bore just to be extra painful. Father Figures is a lifeless and extremely unfunny comedy that has severe tonal clashes with its more dramatic scenes, and is surprisingly and sleep-inducingly boring even for a tired and lazy comedy like this.